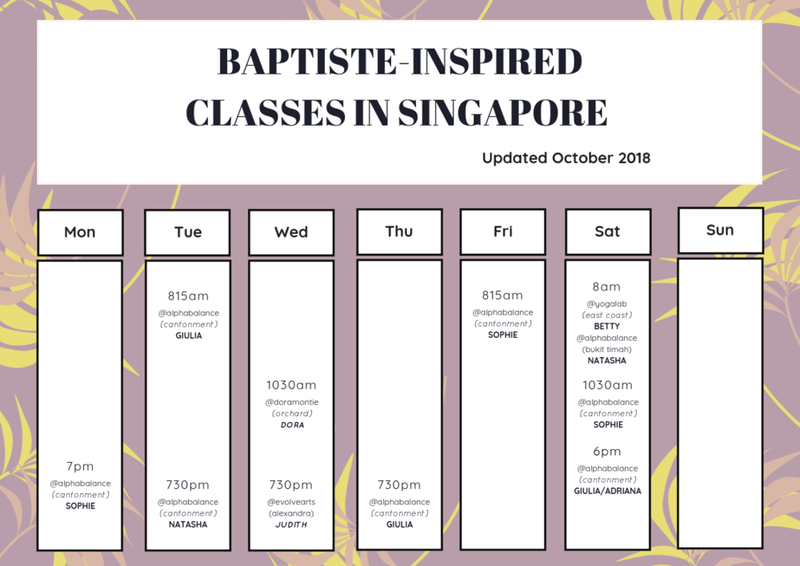 Baptiste Yoga Singapore was founded in 2017 by Sophie Kassim and Trish Corley. Their main goal was to be of service and to share their love of Baptiste Yoga to the Singapore yoga community. They started with free monthly mastery sessions where as a community, they practiced asanas, meditated and wrote in their journal. There were also free quarterly community classes. It is a burgeoning and vibrant community of Power Yoga Practitioners in Singapore. It is a community without walls where anything is possible if we come from a place of anything is possible. It is a community space where we can connect, make new friends, practice yoga, explore possibilities in our practice, teaching and life, and get inspired and be inspired by people in our community. Baptiste Yoga or Baptiste Power Vinyasa Yoga is a style of power yoga developed by Baron Baptiste, an American, who inherited his love for yoga from his parents (who opened San Francisco’s first yoga center in 1955). A class can be, 60, 75 or 90 minutes long and is practiced in a heated room to 30-32degrees Celcius. We are lucky to be living in Singapore because there is natural heat but sometimes the practice can be held in an aircon studio, of which we would then need to focus on using more ujjayi breath to warm our bodies up. You can expect downward dogs and sun salutations as Baptiste Yoga has its roots in traditional Hatha teachings, with elements of Ashtanga, Bikram and Iyengar. The structure of each class follows a set sequence as prescribed in Baron’s book, “Journey into Power”, but the flow will be different depending on the teacher, who may modify their classes depending on the needs of a specific group of students. Flow with us. We have regularly scheduled Baptiste-Inspired Flow classes (see below). The information is correct as per the date indicated. Currently there are 2 certified Baptiste teachers in Singapore - Betty & Sophie.